Potter's Clay is one of the biggest colors of Fall 2016. It is like a very dark Burnt Orange. I would describe it as the child of burgundy and orange. My new (and currently only) bodysuit is indeed in this hot Fall shade - Potter's Clay. I love how Pantone named this particular color this year because it describes it perfectly. Well, while I love my bodysuit I don't necessarily like (at all) how I look in it, at least not in this outfit. This year I have gained a few pounds I have not been proud of and this bodysuit tucked into these jeans makes my mid-section and hips look even larger. I have had these jeans in my closet for years. I was undecided whether to get rid of them or not and these photos definitely convinced me to. They make my hips wide, are not flattering on me and I don't care for their capri length. So off they go bad-looking jeans and I am calling this outfit a failure. But you know it is good to post our not-so-great fashion moments too, keeping it real and keeping us humble at the same time. It was such a gorgeous, warm, mid-60s Fall day as these photos testify. These are a couple of weeks old, we have had even warmer days since then (up to 80). I would love to wear this bodysuit again this Summer but tucked into a High-Waisted Skirt with some heels. Note to self though: Potter's Clay pairs very nicely with leopard. 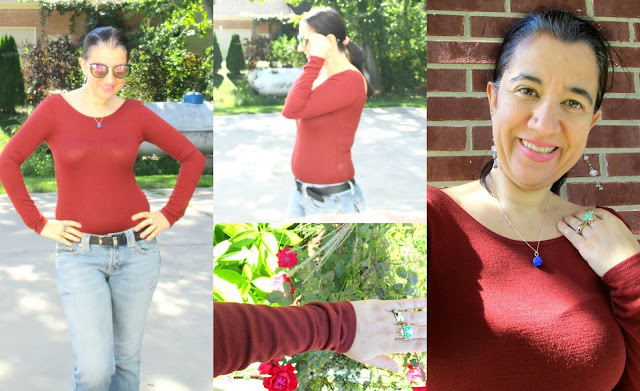 Potter's Clay/Burnt Orange, Long-Sleeve Bodysuit: Forever 21 (New) (similar tee, Great Deal), (loose tee option, Steal). 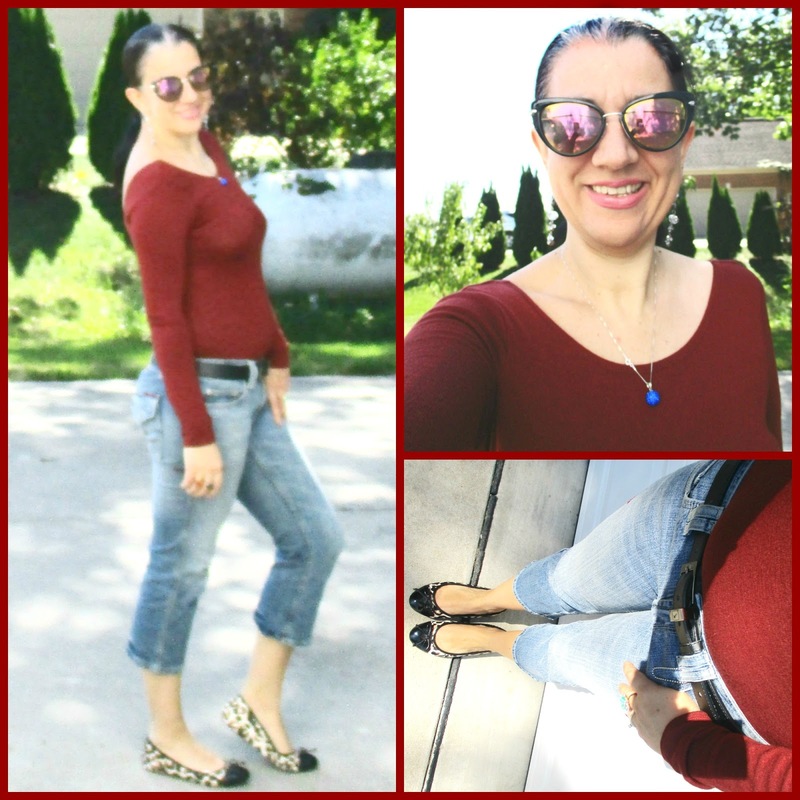 Light-Wash, Capri Blue Jeans: Purchased at "Eaton Centre" in Toronto (Old) (similar w/ cuffed hem, Huge Steal, love these),(similar, Steal), (similar, Great Deal). Black Leather Logo Belt w/ Square Bucket: Nike (identical, Great Deal), (very similar, love this), (similar reversible option, Great Deal, my Favorite). Silver Crystal-Beaded, Skinny Long Drop Earrings: White House Black Market (similar, Steal, love these), (similar, Splurge). Silver Dainty Chain Necklace w/ a tiny Royal Blue Pave Ball Pendant: A Local Boutique in Albania (very similar w/ different logs/initials, love these), (similar, Splurge, my Favorite). Leopard Calf-hair Ballet Flats w/ Skinny Bows & Black Patent Leather Capped Toes: White House Black Market (very similar, on Huge Sale), (similar, Steal), (similar w/ red capped toe, Great Deal, my Favorite), (similar, Splurge). I shared my love for Burgundy last week. Well today (and tomorrow - stay tuned) is all about Potter's Clay. Below I compiled a widget of a dozen or so favorites in this gorgeous, rich, rustic color of 2016. I wouldn't mind if any or better yet - ALL - of these magically appear in my closet, this year. 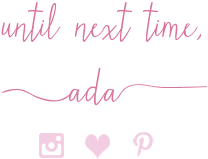 These are all from some of my favorite brands too that I have shopped and loved for years. 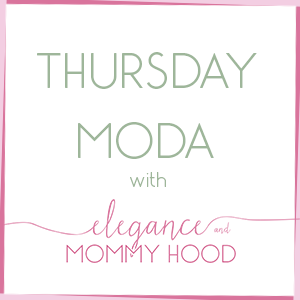 The linkup will be open even earlier tonight, so come join "Thursday Moda" tonight starting at 6.00 PM Eastern time. Let's see your latest fashions! Thank you and Happy Hump Day!